A harvest and not a winnowing, this volume collects 103 stories, almost all of the short fiction that John Updike wrote between 1953 and 1975. "How rarely it can be said of any of our great American writers that they have been equally gifted in both long and short forms," reads the citation composed for John Updike upon his winning the 2006 Rea Award for the Short Story. 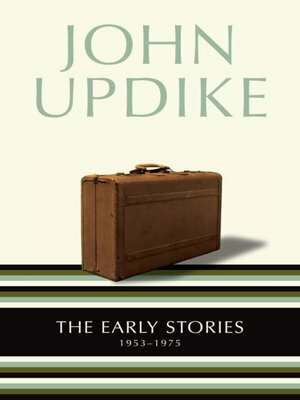 "Contemplating John Updike's monumental achievement in the short story, one is moved to think of Nathaniel Hawthorne, Henry James, Ernest Hemingway, and perhaps William Faulkner--writers whose reputations would be as considerable, or nearly, if short stories had been all that they had written. From [his] remarkable early short story collections . . . through his beautifully nuanced stories of family life [and] the bittersweet humors of middle age and beyond . . . John Updike has created a body of work in the notoriously difficult form of the short story to set beside those of these distinguished American predecessors. Congratulations and heartfelt thanks are due to John Updike for having brought such pleasure and such illumination to so many readers for so many years."